It's well known that Bruce Lee took his workouts very serious; there was no playing around when it came to his training and fitness development. He sought out everything he could to push him further in his quest for physical conditioning and his perfection of Jeet Kun Do. Over the years he did things that for the times, was ahead of anyone else in his pursuit of perfection. Those of us today looking for some inspiration can learn from Bruce and apply some of what he had learned in our own pursuit of fitness or our outlook on life. Hope you enjoy these little bits on Brice Lee below. Bruce Lee had his own way of defining martial arts and how to train to really fight. He did not go along with the traditional methods of other martial art styles where you follow set moves and methods, he believed in using whatever worked best from every style and putting them together. Bruce Lee's fitness training also followed that thought and he worked hard at it to be the best he could be. In a way he was ahead of his time, what he tried to do in the 1960's is kind of what has become popular today, mixing different exercises to strengthen the body in a more realistic way. Only he took it to the next level. This is the expanded edition of Bruce Lee’s great book on his science and philosophy behind his fighting system. The Tao of Jeet Kune Do is a compilation of Bruce Lee's essays and notes that was originally published in 1975. This was a martial arts guide as had not been seen before. The philosophy and science behind Bruce Lee's fighting system called Jeet Kune Do was is explained in detail and illustrated with hundreds of his own pictures. This new edition is a collaboration between Bruce's daughter Shannon and Bruce Lee Enterprises. It has been updated, remastered and expanded and covers topics such as enlightenment and Zen. Also covers grappling, kicking, striking and footwork. The introduction is by Bruce's wife Linda Lee. If you are a fan of Bruce Lee or just have an interest in Martial arts this is a must read. 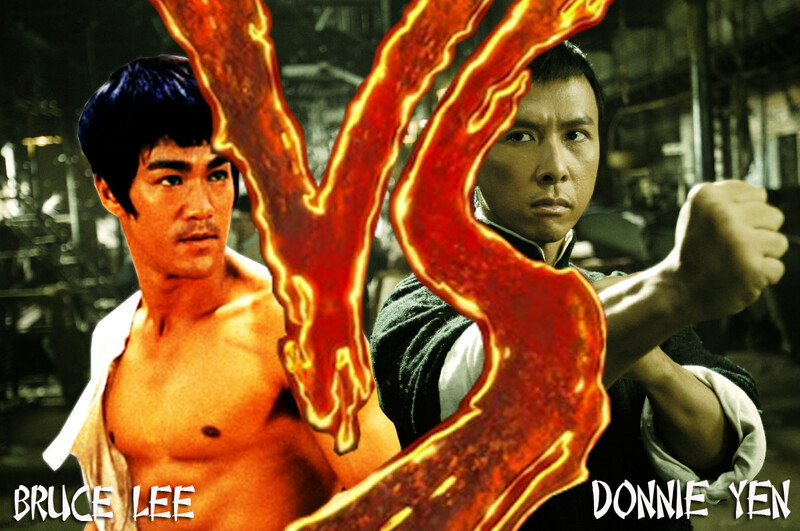 You will have a look into the mind of one of the worlds greatest martial artists. The idea for this book came to Bruce while he was in recovering from a back injury in 1970. He could not train for six months while he wearing a back brace. Being he was always very active this period of inactivity was very stressful for him. It was during this period that Bruce decided to write a book on the system of martial arts he was developing that he call Jeet Kune Do. He compiled many of his writing during a single session which gave a natural flow of info. During his development of his combat philosophy he kept many notes which would also be used in his book. The combination of these notes and the specific writings would become to be known as his Tao Of Jeet Kune Do. Bruce was concerned about how his writings would be used and kept putting off have them published. It was not until after his death that his widow Linda Lee decided to release the info in this book form in 1975. Bruce is not the complete author of this book as the publisher helped compile all of the information Bruce Lee had written. Bruce is well known for his incredible physique. His body fat level was very low. Many Bodybuilders - Lou Ferrigno, Lee Haney, Dorian Yates, Rachel Mclish, Lenda Murray and Flex Wheeler to name a few have all talked of Bruce's influence on them. Keep in mind he only weighed about 140lbs and stood 5' 8" tall, he was not a large person in size but was huge in confidence. Bruce Lee was known to try everything and anything to achieve his goal of perfection in his physical fitness. He would experiment with his workouts trying to find the best way to reach his goal. He liked to always keep his muscles guessing as to what was coming next. He was big on improving his cardio vascular condition, he believed running to be the best way to achieve this. Bruce Lee trained pretty much every day for hours; someone once said that he never turned his engine off. He would lie in front of the TV in the evening with his son Brandon sitting on him while he worked out. He was a big reader and had an extensive collection of books on exercise, fighting techniques and philosophy. Short clip of Bruce Lee doing two finger push-up with one hand. Jab his fingers through an unopened Coke can at a time when they were still made of steel. Bruce once caved in a protective headgear made from heavy steel rods that had previously withstood several blows from a sledgehammer. He could hold an elevated v-sit position for 30 minutes or longer. He could use one finger to leave dramatic indentations on pine wood. Bruce could break wooden boards 6 inches thick. He performed 50 reps of one-arm chin-ups. Let me give you a bit of warning: just because you get very good at your training it should not go to your head that you are an expert. Remember, actual sparring is the ultimate, and the training is, only a means toward this. 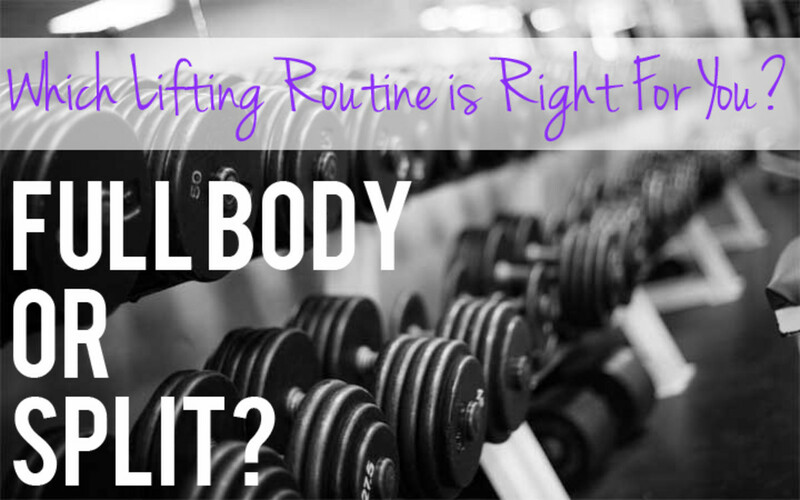 Besides running, one should also do exercises for the stomach - sit-ups, leg raises, etc. Too often one of those big-belly masters will tell you that his internal power has sunk to his stomach; he's not kidding, it is sunk and gone! To put it bluntly, he is nothing but fat and ugly. Don't get set into one form, adapt it and build your own, and let it grow, be like water. Empty your mind; be formless, shapeless - like water. Now you put water in a cup, it becomes the cup; you put water into a bottle it becomes the bottle; you put it in a teapot it becomes the teapot. Water can flow or it can crash. Be water, my friend. Jesse Glover - "When he could do pushups on his thumbs and pushups with 250lbs on his back, he moved on to other exercises". Herb Jackson - "The biggest problem in designing equipment for Bruce was that he'd go through it so damn fast. I had to reinforce his wooden dummy with automobile parts so he could train on it without breaking it. I had started to build him a mobile dummy that could actually attack and retreat to better simulate "Live" combat, sadly Bruce died before the machine was built. It would have been strung up by big high-tension cables that I was going to connect between two posts, one on either side of his backyard. The reason for the machine was simply because no one could stand up to his full force punches and kicks, Bruce's strength and skill had evolved to point where he had to fight machines. Bruce was very interested in strength training; you could say that he was obsessed with it". Linda Lee - "Bruce was forever pumping a dumbbell which he kept in the house. He had the unique ability to do several things at once. It wasn't at all unusual for me to find him watching a boxing match on TV, while simultaneously performing full side splits, reading a book in one hand and pumping the dumbbell up and down with the other. 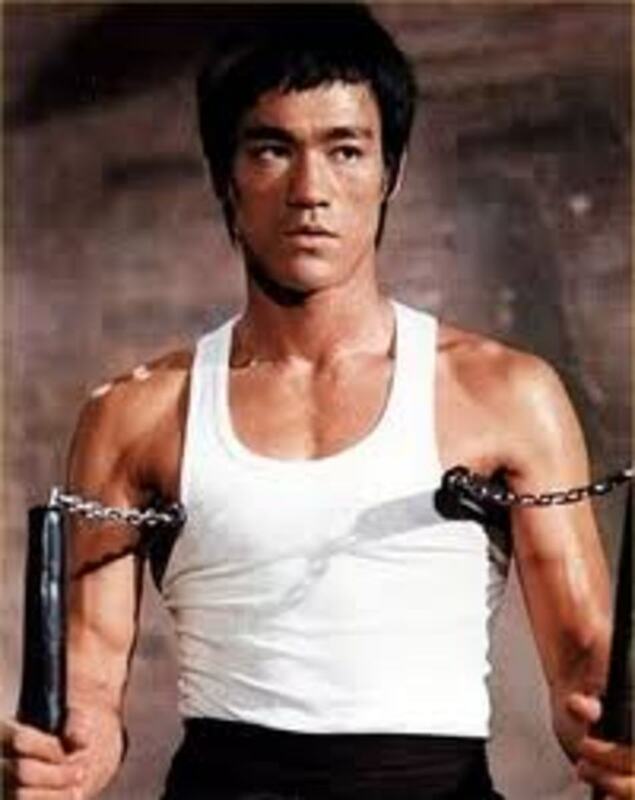 Bruce was a big believer in forearm training to improve his gripping and punching power. 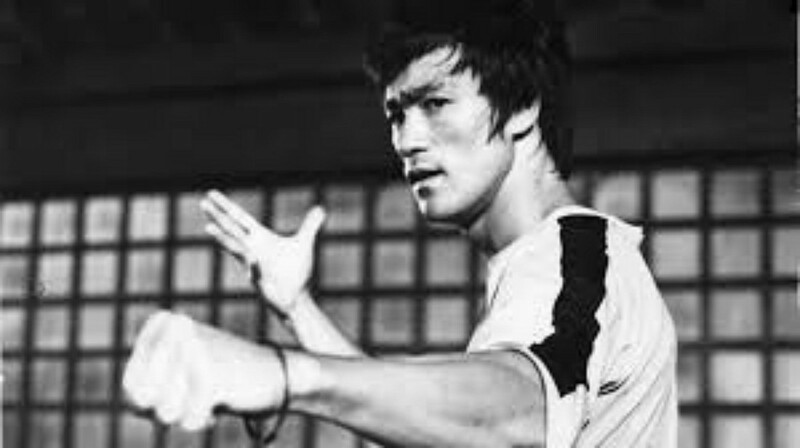 He was a forearm fanatic, if ever anyone came out with a new forearm course, Bruce would have to get it." Linda Lee - "He was a fanatic about ab training; he was always doing sit ups, crunches, roman chair movements, leg raises and V-ups". Linda Lee - "Bruce's waist measurement certainly benefited from all of the attention he paid to his ab program. At its largest, his waist was 28 inches. At its smallest, his waist measured less than 26 inches". Did Bruce learn about the power of positive thinking? 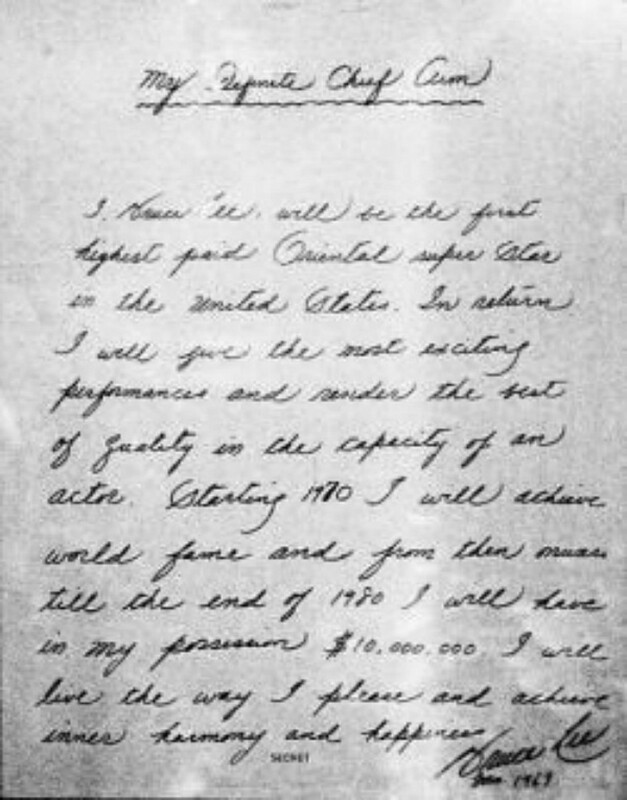 One would think he did by reading this letter he wrote to himself. I believe he carried it with him and would read it to himself from time to time to help reinforce the belief that he would reach the fame he was seeking. Bruce Lee was known to consume a lot of healthy foods as he believed a good diet was one of the keys to successful physical fitness. He was not one to eat junk food as there was no nutritional value in it. He is a real legend. He was perfect not only physically, but mentally as well. Thanks for the lens. I own "The Art of Expressing the Human Body" and it's an incredibly well done book. So many exercises a person can learn and try, with excellent explanations. Superb. Bruce Lee was (and still is) truly a Legend. He was far ahead of his time, and to this day, many still don't fully appreciate his outstanding contributions to the Martial Arts. May his legacy live on. Such a legend. One of my favourite philosophers. But could he do quadruple unders? His close range punches were epic! I still watch the 6" punch video in amazement. Bruce Lee was amazing. Could he really do 50 one arm chin-ups? I like Bruce Lee. Nice lens. Ah Bruce Lee, I feel that martial arts was brought to the world from this talented force. My all time hero. A legend who can never be replaced. Enter the Dragon I watch it over and over. So great. great lens. bruce was very fit and a real inspiration even today! 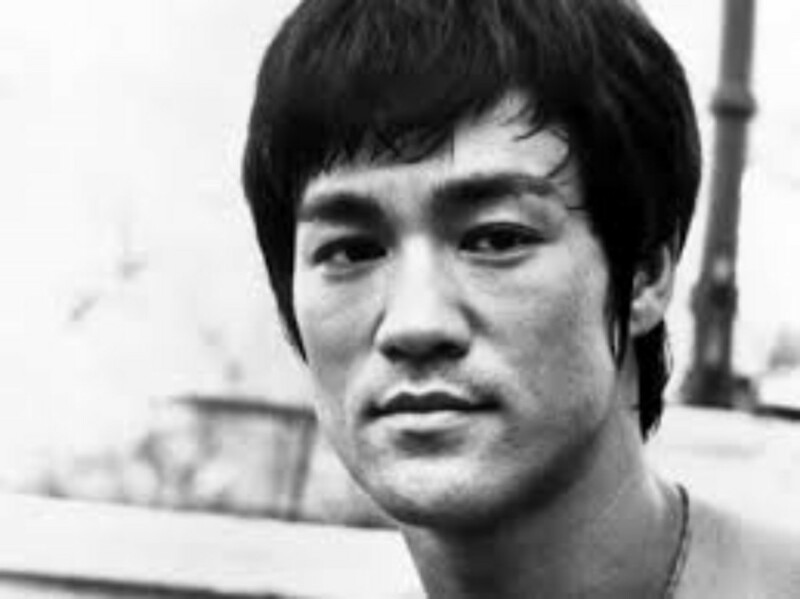 Bruce Lee is very inspiring person, I love hes mindset and philosophy..Nice lens. A very interesting read - thanks for sharing! You can check out "The Warrior Within" for a Chuck Norrris tribute to Bruce Lee featuring many of the world's greatest martial artists. thanks for the matter which could help me a lot in making my body fit and strong..
A very enjoyable read. You gotta love Bruce Lee. I love the two finger push up, Bruce will always be the man. Thats an awesome old school video for Bruce! Martial arts training is some of the best you can do, it also crosses over into many other sports as it develops your balance and core strength. Great lens! He was a legend. A true motivation for all the body builders of recent times...nice lens! wow really amazing, pushup 2 finger!! I really like the Bruce Lee Quotes part. He was one of the most inspiring figure ever excited. I love Bruce Lee, the kungfu and her movie. Very entertaining, interesting, and fun too. Thanks for the information! Excellent lens to inspire us all to action! Bruce's dedication to training his body and his mind is mindblowing. I admire his drive and determination. Those quotes about him are awesome. Cool lens. 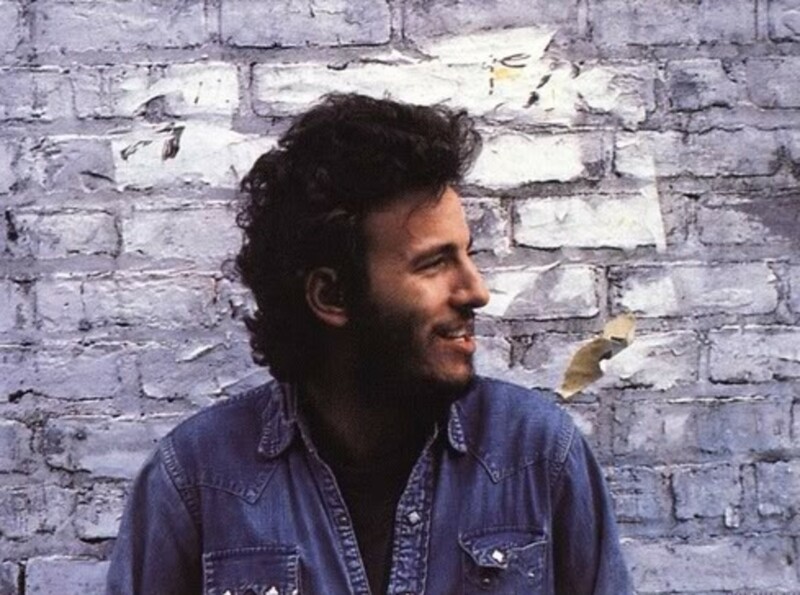 No Doubt that Bruce was a Master. No one can beat him in his techniques. Incredible. My family has always been Bruce Lee fans. He was an incredible athlete! We watched his movies just last week. Bruce Lee was an extraordinary martial artists, his skill, fitness, dedication and work ethic were second to none. These attributes have influenced many athletes from all sports, disciplines as well as everyday people. Bruce is missed by everyone even the people that did not know him. Definitely the greatest of all time. Bruce Lee is one and only! Bruce Lee! What a hero! Bruce Lee really is the only guy who deserves to have death by adventuring on his tombstone. I always love Bruce Lee! Love the BL push up video, grean lens! I had no idea - thanks for sharing. Great Bruce lee info site and loved the quotes. Although not alive - he still has so much to teach us about dedication to training. I am a huge fan of Bruce Lee, I enjoyed this page. Bruce Lee was decades ahead of his time. Great lens, love the 2 finger pushup video! I really enjoyed reading about the late great Bruce Lee. Thank you for the info here. I was around 12 when Bruce Lee was so famous! I will never forget his movie Enter the Dragon. Nice lens! I'm a MASSIVE Bruce Lee fat. Love the lens, keep up the good work. Bruce Lee was my first fitness role model. I've changed a lot since I first discovered fitness, but I always go back to the wisdom Bruce so freely provided. Your lens is very well-organized and I found information that even I didn't know. Well done! I had no idea how much he worked out to keep his physique. I wish I had his discipline. It is hard with a wife and kids, but he obviously did it. I thought your lens on Bruce was inspiring. Thanks for sharing. I love Bruce Lee, although I think he may have pushed his body too much. He is surly an icon. Thanks for these great lenses, best wishes! Nice lens...damn Bruce Lee was intense..obviously haha. Great lens with a lot of good information. Thanks for putting this one together! I own the whole Bruce Lee library. I wish more people knew what an amazing guy Bruce was, shows what the rest of us can be capable of! Bruce Lee was an amazing individual. wow.... this is one good lens .... well done :) martial arts does need you to be very diligent in practice I suppose.... but I never had any idea ..... wow...! I could only hope to be a fraction of how great he was. Incredible lens! Bruce Lee was a master in his work. And he had some tight abs. do you think his abs was tight because of his size or like you said he had his own way of exercising? I wonder how can a person be so strong. An excellent tribute to one of the all-time legends. This is one sick lens on Bruce Lee, nice work and a lot of well put together information. Are you going to be adding more information about his workouts and stuff like that too? That would be a cool module addition. I love this lense great content and facts about Bruce Lee great page. Bruce Lee also became a legend in Wing Chun Kung Fu by Yip Man. I love Wing Chun, one of the best kung fu style I tried. Cool lens on a legend! Cool post! For those who don't know, he was the original Kato in the Green Lantern TV series and became more popular than the main character because of his on-screen stunts. Great Lens. I read every word! im more of a skim over things kind of person, Well Done. The master. doing bodyweight exercises and achieving that kind of physique, my hat's off to the man. Awesome lens. Bruce Lee is a legend! He's the greatest. I have wondered what he would be like today if he was still with us. Would he still be an action star in the movies? Great lens. I love Bruce Lee! nice lense. wow! you actually went through the whole life of bruce lee. nice. i love the workouts he does its crazy. i started a program called insanity workout and it gives me a killer workout i can only imagine what bruce lees workouts were. great information stuff I never would of known about. Great lens. Thumbs up and lens rolled to my Green Lantern lens where I have Bruce featured on a module or two since he played Kato in the 1960s TV Series. Crazy - I just saw a video of Bruce whooping two ping pong masters at ping pong using only his feet and a pair of numchucks. I'm a fan of Bruce Lee. Bruce Lee was a master! I used to really enjoy his dragon movies. Amazing lens. Love Bruce lee. Just still curious how come he and his sons dead, does it call curse?